Vana Nava Water Jungle Hua Hin, The Asia’s first Water Jungle located right in the center of Thailand’s most renowned resort town of Hua Hin. Combining state of the art technology and modern facilities with 19 very exciting rides and slides supplied by the World’s best water park, White Water West industries. The emphasis is on safety, delivering fun without fear. 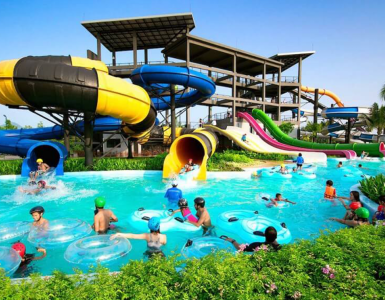 Vana Nava is the only water park in Thailand that adheres to international standards in terms of safety and provision of experienced lifeguards. Vana Nava Water Jungle Hua Hin is packed with the most fun and separated by wet zone and dry zone. The exciting wet zone includes Abyss: The largest water slide in Thailand, Boomerango: The Longest water slide with 179 meters in length, Kiddie Cove has eleven interactive fountains and play structures, including seven slides from which kids can splash down into a child-friendly pool, Coconut Beach: The 1,600 square meters is combined the only Wave Pool featuring a long real sandy beach area with varying wave speeds features islands and lush tropical landscaping, an exhilarating environment in which to float the day away, Vana Nava Falls: Exhilarating! Walk through mountainous Vana and Nava’s Cave to Coconut Beach and the Wave Pool, Lazy River: At over 345 meters in length,one of the longest Lazy Rivers. Infinity Pool at Vana Nava Water Jungle Hua Hin: Lap up the sun in our infinity plunge pool and sip a local drink at Swim up Bar, while enjoy the spectacular view of Vana Vana Falls. At the Dry Zone you will find Ropes Course is an adventure rope climbing that is elevating its visitors to new heights! Carnival Gift and Games is another area to enjoy, relax and entertain friends and family with a variety game machine from NAMCO, the world’s leading game arcade as combining these followings will bring excitement and fun. STAY AT NOVOTEL HUA HIN CHA AM BEACH RESORT & SPA THE BEST HUA HIN BEACHFRONT ACCOMMODATION AND EXPERIENCE VANA NAVA WATER JUNGLE HUA HIN.